The 25th day of the 2015 World Series of Poker saw two bracelets awarded, while just one new event kicked off. Day 25 of the 2015 World Series of Poker saw two more bracelets get awarded. Brian Hastings won his second of the summer and third overall, while Corrie Wunstel won his first. Meanwhile, two events are nearing a winner, the seniors event is down to 65, and the Extended-Play No-Limit Hold'em kicked off. 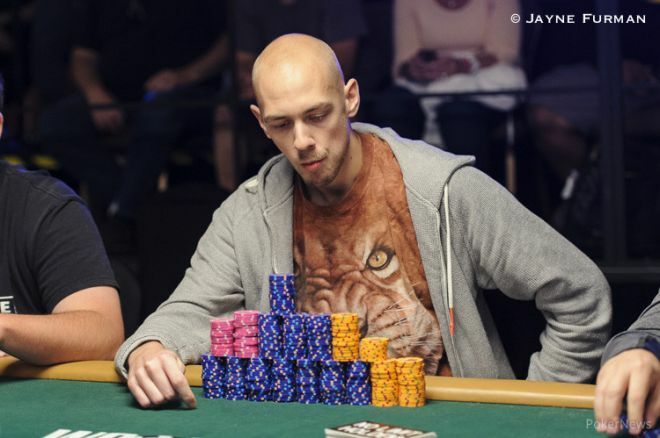 Just a week after he captured his second bracelet by winning Event #27: $10,000 Seven-Card Stud Championship, the online-cash crusher sometimes known as “$tinger 88” followed up with a third taste of World Series of Poker gold. He won Event #39: $1,500 Six-Max 10-Game for $133,403, topping a field of 380. A profitable but frustrating summer continued for Mike “SirWatts” Watson as he busted in sixth place for the third time at this WSOP in continued pursuit of that elusive first bracelet. Tim Reusch (fifth) and Alexey Makarov (fourth) went out next, leaving bracelet winner Todd Brunson to battle with Hastings and Rostislav Tsodikov. Tsodikov sent a short-stacked Brunson packing in a stud hand to take a 2-1 chip lead into heads-up play with Hastings. That's an arena in which Hastings specializes though, as he's long been a top short-handed cash player online and won his first bracelet in the $10,000 Heads-Up Championship. Hastings' skill – and a timely aces full in Stud Hi-Low – proved too much as he took the match over the course of about three hours. After the tournament, WSOP Media Director Nolan Dalla noted that Hastings winning two bracelets so early means joining an exclusive club of players who have claimed three in one year – Phil Ivey, Phil Hellmuth, Ted Forrest, Jeff Lisandro and Puggy Pearson – is well within reach. To read more about Hastings' excellent achievement, click here. Corrie Wunstel and Kevin “BeLOWaBOVe” Saul met up to determine who would claim the first bracelet of his career, and Wunstel emerged the victor after a short heads-up battle, taking down Event #36: $1,500 Pot-Limit Omaha for $267,435. Wunstel, a Lousiana native, was known mainly for his accomplishments on the WSOP Circuit, where he had amassed 23 cashes for $120,286 and one ring. In 2013, he made a deep run in the WSOP Main Event, finishing 65th for $102,102, his biggest cash to date before this win. He entered the unscheduled Day 4 with a chip lead of 4.55 million to Saul's 2.785 million, but with blinds starting at 60,000/120,000, it was still anyone's game. Saul grabbed control early on and had the tournament in his grasp when he called Wunstel's shove with a nut straight on fourth street, only to have Wunstel's set turn into a full house when the board paired on the river. Saul managed one double before Wunstel finished him off with a nut straight against Saul's second-nut straight. A man most famous for a second-place finish finds himself squarely in the running for first in Event #38: $3,000 No-Limit Hold'em. The tournament was supposed to play down to a winner on Day 3, but five players remain, including 2012 Main Event runner-up Jesse Sylvia, who is in second place with 4.08 million. He trails Thiago Nishijima (4.51 million). Sam Razavi (2.657 million), Yun Fan (2.09 million) and Sotirios Koutoupas (1.495 million) also remain in contention for the $546,843 first-place prize. Forty-eight players began the day, with Steve Brecher (ninth place), Jean-Pascal Savard (11th), Ankush Mandavia (12th), Eric Baldwin (15th), 2013 Main Event champ Ryan Riess (19th), Aaron Massey (25th), and Chris Moorman (32nd) among the players busting out during the course of play. The tournament resumes Sunday at 1 p.m. at Level 31 (50,000/100,000/10,000). Event #40: $1,000 Seniors' No-Limit Hold'em Championship brought 567 players back for Day 2, and just 65 remain after 10 levels of play. The most notable names left appear to be bracelet winner and former November Niner Steve Gee (302,000) and three-time WSOP-C ring winner John Holley (179,000). Jim Hopperstead is the chip leader with 886,000. Holley grabbed a double during Level 19 (3,000/6,000/1,000), the third-to-last of the night. He defended his big blind with and flopped trips on against a player holding two tens who bet-three-bet all in. Holley ran a flush to go with his trips. Play hit the money early on with 423 paid. Dao Bac (86th place), TJ Cloutier (126th), John Burkett (292nd – profiled here), John Esposito (305th), and Ted Forrest (357th) were some of the players busting in the money. Play resumes at 11 a.m. Sunday with a plan to play to a winner. Event #41: $10,000 Seven-Card Stud Hi-Low Championship began on Friday with 111 players. That field was trimmed down to 64 players after Day 1 and after another 10 levels on Saturday, only 11 players remain. On top of the chip counts now is Stephen Chidwick, arguably the best player in the game without a bracelet. He'll be looking to capture that elusive piece of jewelry on Sunday, but a tough contingent of pros stand in his way. Max Pescatori is second in chips and already has a bracelet this summer, winning the $1,500 Razz event. Also still in the field is none other than Daniel Negreanu, who called his shot on Day 1 and said he was taking this one down. You can read about Negreanu's Day 2 here as we kept a close eye on his progress throughout the ups and downs of his day. Play resumes at 2 p.m. Sunday and the plan is to play until a champion emerges. The only event to kick off on Saturday was Event #42: $1,500 Extended-Play No-Limit Hold'em. What's different about this one? 90-minute levels throughout the tournament. A field of 1,914 came to play and after seven levels on Day 1, only 543 players remain. The top 198 places will make the money and first place is set at $478,102. On top of the chip counts is Jose Pinedamoncada with 113,950, but many notables are still in the hunt. Among them are Yevgeniy Timoshenko (73,850), Justin Zaki (61,275), Nacho Barbero (47,550), Matt Stout (41,225), Darryll Fish (41,125) and Mukul Pahuja (39,800). Play resumes Sunday at 1 p.m.